Robyn Vilate: hello fab's giving some love! hello fab's giving some love! alright ladies, valentines day is tomorrow! now you may have bought your significant other a little somethin' somethin', but did you snag a little something for yourself?! the adorable online store hello fab wants to offer my readers a fabulous deal this valentine's day holiday! use code: VDAY to get $5 off your purchase of $25! hurry, this offer ends 2/16, but i'm sure you've been eyeing one or two cute things on their website so now's your time! 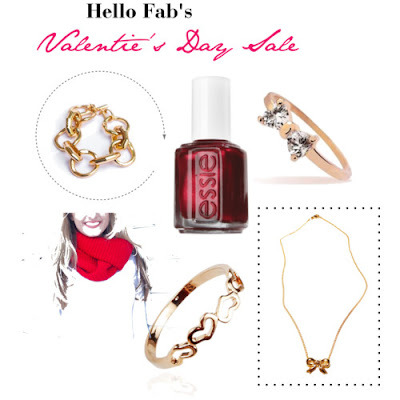 i'm kind of dying over their essie nail polishes and may have to snag a few with this great deal! happy shopping! I absolutely love Hello Fab! Thanks for the great deal! Ooo I will have to visit their site and check them out! I totally need one of those chunky gold chain bracelets!